Sample treatments of oil paintings, including fire damage, water damage, and tear repair. Oil on canvas. 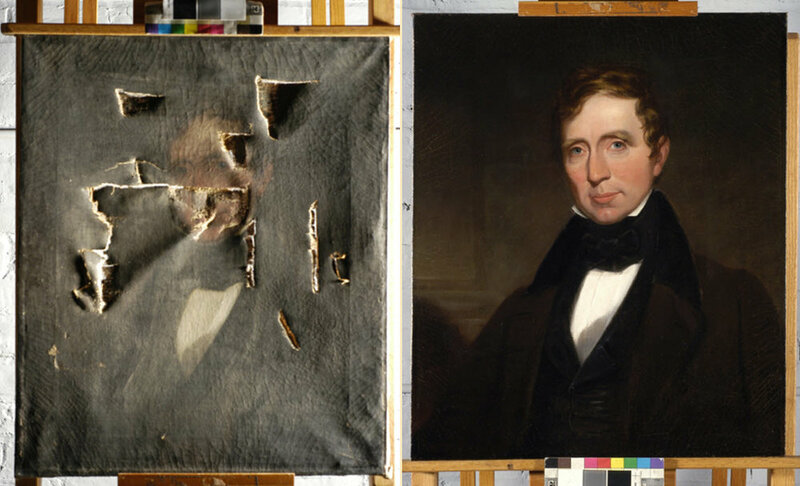 Fire damaged painting, Before and After Treatment, normal illumination. Portrait of Henry Jarrett by unidentified artist, oil on canvas. 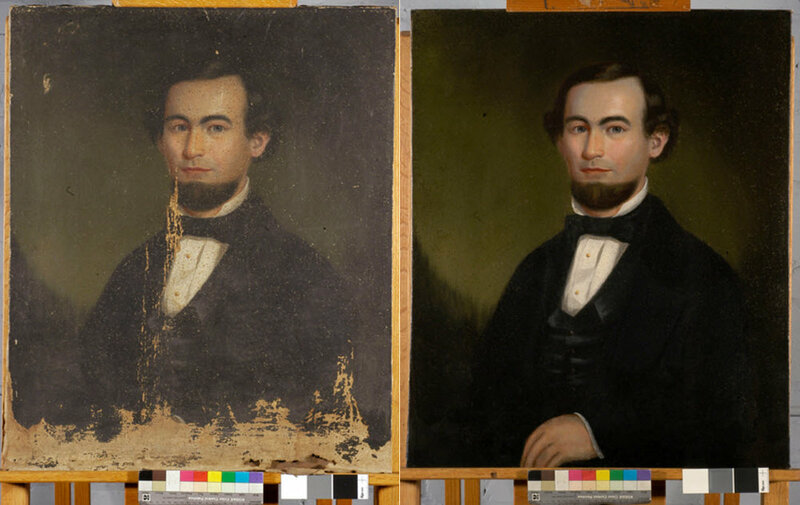 Water damaged painting, before treatment, normal illumination. Unidentified Confederate Officer by unidentified artist, oil on canvas. Unstretched and badly damaged, normal illumination. Before and After Treatment. Oil on canvas, multiple tears. Before and After Treatment, normal illumination. This small portrait was covered with dirt and overpaint. The overpaint was to cover up areas that had been over-cleaned. This lovely little gem is called "Golden Field" and is by an unidentified artist, but presumably Virginian. It was badly torn and covered with grime, but both cleaned and mended very nicely. Lady with a Thimble by an Unidentified Artist, possibly from Tennessee. The painting arrived with a large split down the middle, and having been "oiled out" with varnish many times over. We were unable to remove all of the discolored varnishes, but it still made a significant change. Portrait of a Page Boy by an Unidentified Artist. In the style of late 19th-early 20th century classicists, or the Pre-Raphaelites. The painting had been damaged by water and neglect to the point of huge losses to the paint and canvas. The End of Winter. A lovely Norweigan scene that had a yellowed varnish on the surface. 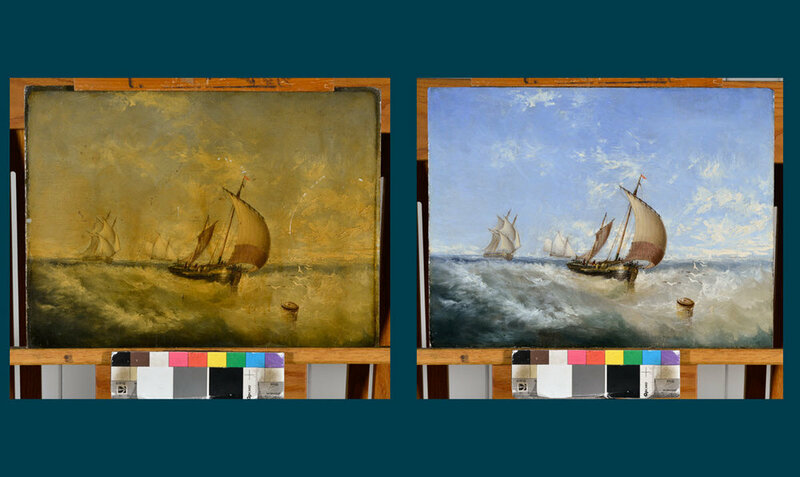 Yellow varnish can dull and flatten the image, and turn beautiful pastel blues and lavenders acidic. Vessels in a Breeze by Samuel Stubbs. Just another gorgeous transformation from cleaning a dark and dirty varnish. Winter Solstice by James T. Shelton. This wonderful primitive piece was caked with grime and an old oil varnish. The transformation was stunning. Colorful Landscape by William Greason. Found in an thrift store for an unbelievably low price, this painting desperately needed to be consolidated and cleaned. Previous restorers had overpainted the areas that were flaking and lost. Portrait of Mr. Forbes by Francois Jacques Fleishbein. Oil on wood panel. Grime removal and inpainting before and after. Old House on Long Island by John Woodward. This painting was suffering from severe cupping and flaking, primarily in the sky. We consolidated, set down the lifting areas, and then lined the painting to a panel to help keep it in plane. The photo shown is using raking light, before and after.